Out on the battlefield.... as the fires still burn. 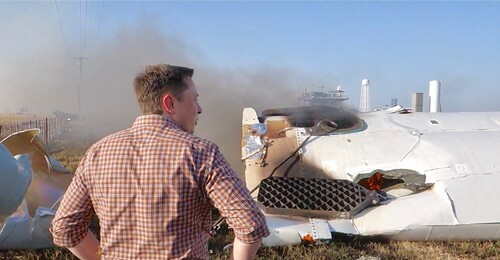 "How Not to Land an Orbital Rocket Booster" — the incredible SpaceX Blooper Reel just came out. My videos were incorporated, including this image. On Aug 22, 2014, we were at the Texas facility and witnessed the final F9R test flight. We started the day with a fun DQ binger, and as we drove out to the launch site, I joked about the big bada boom to come. Not sure why. It was the first flight with three engines going, and a lot more fuel than prior flights. It arched over and something was clearly wrong. Then BOOM! I suggested to Elon that we should go out to the debris field for post-flight analysis... and artifact collecting! That is the quote I am using on the placards for the wreckage remains.